Digital plan printing of all documents from A4 to A0 in black and white and colour and up to 20m in length. Documents can also be reduced or enlarged to scale, laminated or mounted to 3mm/5mm foamboard as required. We can print from original documents, email attachments, CD-ROM, memory cards or any other media type. We can also scan your original documents in full colour and print as specified. Mediatek are specialists in builder’s and construction drawings and architectural plans. Prints can be mounted or laminated if required. 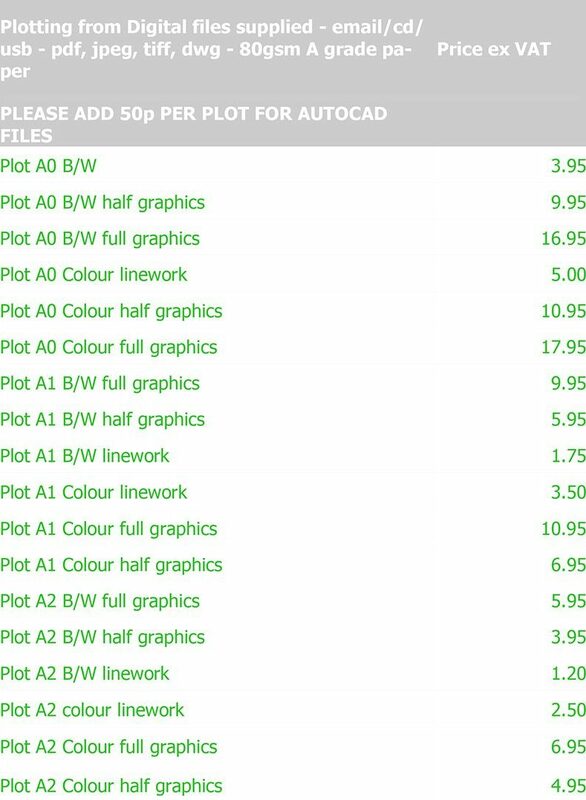 Digital AutoCAD files printed up to A0+ in black and white or colour. Accepted as e-mail attachments, CD-ROM or and other electronic media. We will also download files from your FTP site if required, using services like www.sendthisfile.com, www.yousendit.com or www.dropbox.com (which we use). This may incur an extra charge. Files are dispatched as folded drawings unless otherwise requested. We can also scan and archive original drawings in full colour or black and white up to A0+ in size.